The touring company of “Newsies” is as exciting as the headlines that sell papers. The lead actors who battle Joseph Pulitzer on his unfair practices are terrific, but it is the high energy of the company’s talented dancers and singers who will likely have you recommending this Tony Award winning musical. Now playing at the Cadillac Palace Theatre through Aug. 7, 2016, the musical cobbles together what happened during the 1899 newsboy strike when the New York youngsters who sold the papers stopped doing so because publishing giants Pulitzer and William Randolph Hearst raised the rate the boys had to pay to get papers to sell. What started with a strike in one neighborhood by the youngsters, many of them homeless, spread throughout the city and became a protest about children’s working conditions. The musical, now with lyrics by Jack Feldman, music by Alan Menken and book by Harvey Fierstein, was first a 1992 Disney film by Menken and J.A.C. Redford. The choreography, originally by Kenny Ortega, has been reworked magnificently by Christopher Gattelli. Running the strike machinery are Joey Barreio as Jack Kelly (show name for the real Kid Blink), a talented artist and orphan and Morgan Keene as Katherine Plumber, a society page reporter who wants to do news and is able to get them access to the needed printing press. Fierstein added Katherine for the Broadway show. She really was a combination of Davey’s sister and reporter Bryan Denton who were in the movie. Stephen Michael Langton is Davey, a Jewish boy with a family whose father was laid up in an accident without compensation, so he understands the importance of a union. His kid brother Les, played with panache by nine-year-old Turner Birthisel, and Andy Richardson as the disabled “Cruthie,” add human interest to the conditions the newsboys encounter. Medda Larkin, a sympathetic theater owner and vaudeville singer exuberantly played by Aisha de Haas, befriends the boys. It all plays out against a clever, multi-level metal grid backdrop devised by scenic designer Tobin Ost enhanced by projection designs by Sven Ortel and adapted by Daniel Brodie. 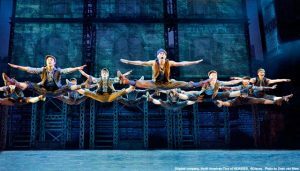 Details: “Newsies” is at the Cadillac Palace Theatre, 151 W. Randolph St., Chicago, IL, now through Aug. 7, 2016. For tickets and information call 800-775-2000 and visit Broadway in Chicago.